Porsche Service Centre Brooklands is unique among Porsche Centres in the UK. 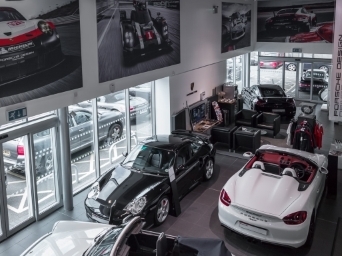 As the only dedicated Porsche Service Centre in the UK network, we offer an unrivalled resource for comprehensive Porsche Owner Services and Porsche Approved Pre-Owned vehicles. What makes Porsche Service Centre Brooklands exceptionally skilled is over 30 years experience buying, selling, repairing and restoring Porsche cars. What makes us special is that our people live and breathe Porsche. 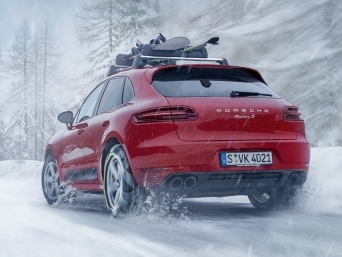 Located in Byfleet, Surrey, Porsche Service Centre Brooklands offers the very best Porsche experience and expertise. We would be delighted to welcome you to our Centre to find out for yourself, but in the meantime, why not take a virtual tour. Our sales team would be happy to assist with any questions you may have relating to our Used Approved Cars on 01932 341 911. 12 o'clock marking in Red, 6-speed GT sport manual transmission, Chrono package and preparation for lap trigger, cruise control, digital radio, front axle lift system, Guards Red seat belts, interior package painted (with leather interior), leather interior with stitching in Red, privacy glass (rear side windows and rear window), reversing camera, heated seats, storage net in passenger footwell, wheels painted in Satin Black with wheel outer edge painted in Guards Red, factory supplied martini decals. Please call 01932 341911 or email rob.newton@porschebrooklands.co.uk for more information. 64-litre fuel tank, cruise control, digital radio, full colour wheel centre caps, mobile phone preparation, net-type wind deflector, online services, Porsche Communication Management (PCM) including navigation module, reversing camera, roll-over bar with exterior colour paint finish, heated seats, Sound Package Plus, sports tailpipe, Spyder classic interior package (steering number), storage compartment lid Alcantara® with Porsche logo, storage net in passenger footwell, two-zone automatic climate control, wheels painted in Satin Platinum (complete), Porsche Approved Warranty until February 2022. 20-inch Carrera S wheels, automatically dimming mirrors with integrated rain sensor, cruise control, light design package, mobile phone preparation, net-type wind deflector, ParkAssist (front and rear), Porsche Communication Management (PCM) including navigation module, Porsche crest embossed on headrests, Porsche Doppelkupplung (PDK), heated seats, Sound Package Plus, Sport Chrono Package, SportDesign steering wheel, sports exhaust system. BOSE® surround sound system, Carmine Red seat belts, front centre console armrest with porsche crest, instrument dial rev counter painted in Carmine Red, light comfort package, navigation module for Porsche Communication Management (PCM), panoramic roof system, 75-litre fuel tank, rivacy glass, roof rails painted in Black, heated seats (front), sideblades painted in exterior colour, smokers package, Sport chrono package. 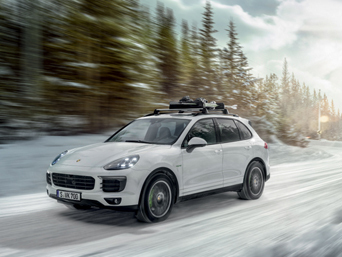 18-inch collapsible spare wheel, 20-inch macan sportdesign wheels, 75-litre fuel tank, comfort memory package (14-way), mobile phone preparation, ParkAssist (front and rear) with reversing camera, Porsche Active Suspension Management (PASM), Porsche Communication Management (PCM), power steering plus, sideblades painted in exterior colour, speed limit indicator, towbar system with electrically deployable towball. 18-inch collapsible spare wheel, 21-inch 911 turbo design wheels with wheel arch extensions, adaptive Sports seats with comfort memory package (18-way), air suspension with self-levelling, ride-height control and Porsche Active Suspension Management (PASM), automatically dimming interior and exterior mirrors, BOSE® surround sound system, Bi-Xenon headlights incl. Porsche Dynamic Light System (PDLS), comfort lighting package, digital radio, full colour wheel centre caps, mobile phone preparation, panoramic roof system, ParkAssist (front and rear) with reversing camera, Porsche Communication Management (PCM) with navigation module, oreparation for Porsche rear seat entertainment, roof rails in Aluminium including roof transport system, roof spoiler separation edge painted, heated seats (front and rear), SportDesign package with side skirts. Porsche Service Centre Brooklands offers highly competitive finance packages on Porsche Approved Pre-Owned vehicles up to 15 years old. We would be delighted to discuss your individual requirements in more detail to tailor a suitable agreement. Porsche Service Centre Brooklands prides itself on being expert in the buying, selling, repair and restoration of classic Porsche cars. From complete rebuilds to sourcing hard-to-find parts, our team of Porsche-trained Technicians can help you with whatever your classic Porsche needs. And, if you're looking to purchase a classic Porsche, our classic experts can source whatever your heart desires.